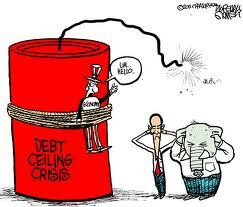 I Me My: US Debt Ceiling Crisis Holding the Country Hostage? Congressman Rush Holt Feels Crisis a Result of "Economic Brinksmanship "
US Debt Ceiling Crisis Holding the Country Hostage? Congressman Rush Holt Feels Crisis a Result of "Economic Brinksmanship "
"Thank you for contacting me about the federal budget. I appreciate hearing from you. The debate over the budget goes to the heart of how we govern and how we increase economic opportunity and create jobs. On one side are those who believe we need to invest in our workforce and our infrastructure, just as we did with the GI Education Bill, the national highway system, and our science workforce after the Russians beat us into space with Sputnik. On the other side are those who respond that "investment" is a code word for wasteful spending. This debate gets to the basic reason our founders banded together to make a more perfect union. They realized there are things we can do as a nation, as a self-governing people together, to improve opportunities for individuals and their families, to provide fairness in bearing the responsibilities and costs of civilization, and in providing both economic and physical security. Today Americans find ourselves with more than 15 million people who need to get back to work. That is by far the most important concern we face. To get Americans back to work in jobs where they can thrive is not only the humane thing to do; it is the essential, missing piece of dealing with our lackluster economy and our deficit and debt problems. That is where Congress should be focusing our efforts. Although the debate over who should be helped by our government and who should pay for it is as old as our country, it has come to a critical point now because Congressional Republicans have said they will not pass a routine extension of the debt limit unless the President and the Senate first cut back on government services. This is not only short-sighted and cruel, it is backwards. The debt is the result of past decisions on spending and taxing. The decision before us today is whether we should pay our debts and let the world know that the U.S. always pays her debts. Of course, we should pay our debts. Not to pay these debts would be dishonorable and very expensive to individuals, to businesses, indeed, to all Americans. In May I voted in favor of a stand-alone measure to raise the statutory debt limit, which failed to pass the House. This bill would have prevented the United States from defaulting while providing Congress and the President with the time necessary to craft thoughtful policies to improve our economy in the near-term and address the debt and deficit over the long-term. Unfortunately, the vote was the latest example of economic brinksmanship, which is becoming all too familiar in Washington. After bringing the federal government within minutes of a shutdown in April, now Congressional Republicans are once again playing a game of chicken with the national debt, needlessly endangering our financial security. According to Treasury Secretary Timothy Geithner, without Congressional action, the United States will begin defaulting on its debts on August 2, 2011. In the 1990's Congress balanced the budget. A mere decade ago the United States had a budget surplus. It did not require a Balanced Budget Constitutional Amendment; it required some sensible decisions by Congress and the President to match our taxes and our expenditures. It is worth remembering that Democrats in Congress passed tax increases along with cutting Cold War-era defense spending in the early 1990's, without any Republican votes in support, and put the country on the path for a decade of prosperity. As a result, our families and workers had more after-tax income than they had had in decades. The U.S. would have paid off most of its debt if we had stayed on that course and not pursued the unpaid wars of the Bush years and other poor economic policies. While the United States must address its long-term budget problems, in the near-term it is more important for Congress and the President to confront directly slow economic growth and persistent unemployment. Higher employment will increase tax revenues and reduce the strain on the social safety net, naturally lowering deficits. As Douglas Elmendorf, Director of the nonpartisan Congressional Budget Office, has noted repeatedly "there is no intrinsic contradiction between providing additional fiscal stimulus today, while the unemployment rate is high and many factories and offices are underused, and imposing fiscal restraint several years from now, when output and employment will probably be close to their potential." There are many worthwhile ideas to help boost our economic vitality. For example, Congress could match federal funding with state and private investment to upgrade our nation's aging infrastructure through the development of national infrastructure development bank. I am a cosponsor of legislation that would establish such a bank. Congress could provide states and localities with money to prevent layoffs of teachers and first responders and provide strong incentives for businesses to hire more workers. I have supported such efforts. Congress also could extend popular renewable energy and energy efficiency tax credits that will expire in December. We could pass my bills that extend the research tax credit, make it valuable even to start-up companies with little profit, and reward investors in those companies. Congress must promote innovation, improve math and science education, fight for policies that keep jobs in America, make college more affordable, invest in advanced industries such as biotechnology and clean energy, and reform the tax code so that it encourages investment while being fair to middle-class families. In short, economic growth should be our focus, but we will not get it through the voodoo economics of Congressional Republicans that is long on rhetoric and short on historic evidence that it works. Over the long-term, as we continue to stimulate the economy, Congress must enact fiscal policies that bring down our national debt to its post-World War II historical average of approximately 40 percent of Gross Domestic Product. I support the "pay-as-you-go," budgetary principle to accomplish this goal. This is only one tool, but it is a strong one to return our nation back to fiscal stability. It forces Congress to identify inefficient or ineffective programs whose funding can be cut to fund higher priorities. I am disappointed that Congress forgot this simple lesson last decade. Of course, we always should be looking to remove wasteful spending and ineffective programs. It is unfortunate; however, that the public debate has focused so singularly on the deficit, rather than more broadly on economic vitality and fiscal policy. Deficit reduction should not be an end in itself; it is the result of wise government actions and economic growth. I have supported and will continue to support thoughtful budget cuts that eliminate unnecessary spending and costly tax expenditures. Military spending, in particular, could be curbed significantly. At more than $650 billion, the Pentagon's annual budget accounts for nearly as much as all military spending of all other countries in the world, allies and adversaries alike. I am leading a bipartisan effort in the House of Representatives to make defense spending cuts part of any plan for deficit reduction. While we pursue cuts, we also must preserve investments in infrastructure, research and education, along with safety-net programs that assist the most vulnerable among us in obtaining housing, health care, and food – essentials that are necessary for a humane society. Any fiscal plan hoping to reduce federal budget deficits will have to generate more revenue and not rely on spending cuts alone. Currently, federal taxes are at their lowest level since 1950 – 14.4 percent of our Gross Domestic Product (GDP), while federal expenditures equal 25 percent of the GDP. These must be brought more in line with each other. To raise sufficient revenues I support removing the tax subsidies for large and successful companies. How can anyone justify a company like GE paying almost no taxes, or a company like ExxonMobil—the most profitable company in the history of the world—getting billions of dollars in subsidies? I also support getting a fair share of support from the top two percent of taxpayers, returning their taxes to the levels they had during the prosperous 1990's. Again, thank you for taking the time to contact me. As Congress considers measures concerning the federal budget and national debt, I will keep your thoughts in mind. I look forward to hearing from you again about this and other issues. oh my! I Me My, the letter itself set me to DEFAULT already... strange times is living this beautiful country, too sad, politicians at their worst! It's about time someone has finally said it out loud. So what are the downfalls and what are the benefits. Making things here will cost a little more. A whole lot less Americans standing in unemployment lines. I agree... bring manufacturing back into the USA and reduce unemployment even if it means spending a bit extra on a 'made in USA' product. Even for a foreigner this is interesting read. All over the Western World politicians of all creed tried to implement the idea that you can get rich by borrowing. And now we have reached the level where further borrowing becomes impossible. Keeping jobs at home is impossible as long as we are not ready to pay three times as much for some items or services. It is us and only us who decide where to buy. What do you think of the S&P downgrade of US debt? US spending (across all sectors, public and private), for a very long time, has been on consumption of goods, rather than on investment in infrastructure - and by infrastructure, I don't just mean roads and buildings, I also mean productive capacity, the means of production. Without production, how do we make things to sell to earn money? And that spending? It's been fueled by debt. So, let's see... we are spending what we don't have, and have to borrow... and we aren't investing in production, so we can't earn money to pay back the debt. Makes you think, doesn't it? Debt to fuel investment has historically worked out okay. Debt to fuel consumption? Not so much. Visit to India Part II - "An Ode to Fairness".